Sending emails via the SMTP protocol (that is, relying on an outgoing SMTP server) is still the most common way to communicate on the internet. However, SMTP has been built without a native security layer: meaning that your emails will always be exposed and quite easily hackable. That is why we suggest to set a secure SMTP with an encryption protocol – the most popular being SSL (Secure Socket Layer) and TLS (Transport Layer Security). Basically, an SMTP server with SSL/TLS starts a connection with the receiving server passing only encyripted information – thus making it a lot more difficult to others to break it. So, how to configure an SMTP with SSL/TLS? It’s very simple: you just need to open your mail client’s configuration panel and flag “Use SSL/TLS” in the “Connection security” field. 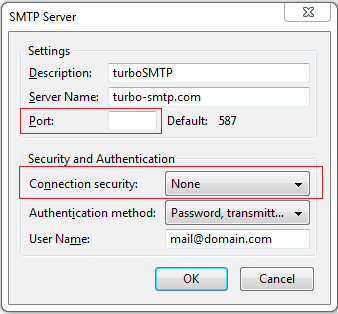 Remember also to set the right SMTP SSL port for the email transmission – normally, port 465. Remember finally that if you want to ensure a faster and even more reliable delivery for all your emails, you should definitely try a professional SMTP service. With turboSMTP you can get 6.000 emails per month for free, forever – and then upgrade to a plan in case you need more.